Cycle wings in aluminium and with full wired edges and are standard MMM pattern with sharp centre rib. 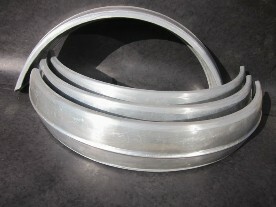 Each set of 4 are supplied with 8 wingstay strengthening strips which the enthusiast can secure to the preferred position when drilling the holes to attach the wingstays. The width is 6 inches, 48 inches circumference tip to tip and 33 inches diameter tip to tip.